Since reading Something to Say, I’ve found myself asking the adults I know who — as adolescents — sang in youth choruses, played in youth orchestras, or hurried off from school to the arts league for sculpture class, what drew them to out-of-school arts programs. Just today, a music director told me that her mother saw an advertisement for youth chorus auditions in the local newspaper and said, “Maybe you should try out for that.” Print media is how she found it, but making friends made her stick with it. While recruiting teens through newspaper ads sounds quaint, the draw of spending time with friends remains as an important motivating factor, as revealed in market research conducted by Next Level SMG for The Wallace Foundation and summarized in Something to Say. Among the report’s distinctive qualities is its focus on tweens — young teenagers — whose behavior is no longer fully dominated by their parents, but who are not fully their teen selves and are motivated primarily by peers. Foundation president Will Miller explains, “we wanted to learn what tweens think about afterschool arts programs and the factors that inform their decision to participate or not.” Rather than looking at the problem of low-income youths’ limited participation in the arts as being caused by a lack of supply, they analyzed consumer demand through focus groups and interviews with tweens and their friends and families. Alongside the market research, the research team gathered opinions about best practices of out-of-school-time arts programs from adult experts in the field. When faced with choosing among structured art programs, the tweens identified the following factors as being important: “professional and expert instructors, experiential learning in inspiring spaces, the prospect of new friends focused on similar interests, culminating and competitive events, and program extras and proven incentives such as snacks and markers of involvement like T-shirts.” Many also wanted to be able to try out something before they committed to it. Researchers working on Something to Say were careful to analyze the market research into the tweens’ opinions discretely from their synopsis of interviews with experts in the field, yet the two groups’ descriptions of outstanding programs are similar. Both emphasize the importance of connecting youth with professional artists, emphasizing hands-on skill building, and providing youth with opportunities to participate in high-profile public events. Both groups highlighted the importance of basing programs in inspiring spaces. Adult experts also noted that those spaces and program activities need to be physically and emotionally safe, and that executive leaders need to be deeply committed to the work. 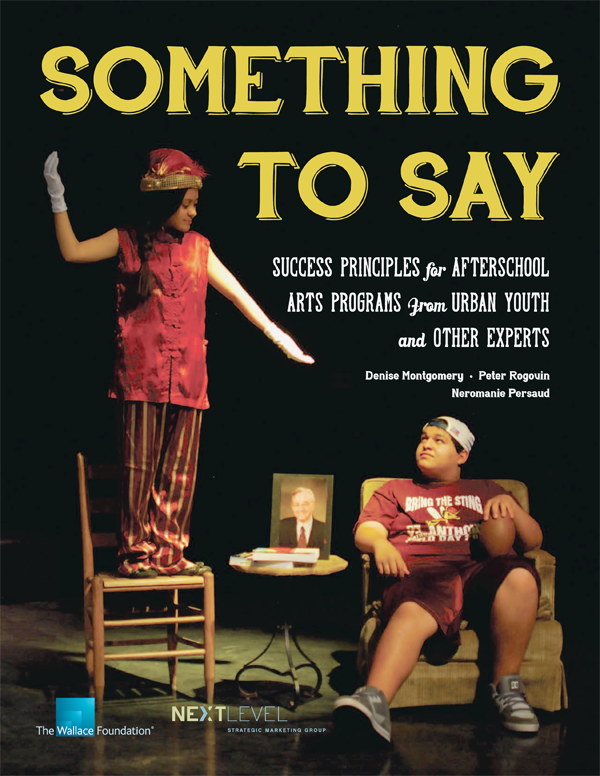 Something to Say is important for its fresh approach to inviting tweens’ voices into the conversation. The market research raises hard questions for practitioners, including, How can programs be structured without seeming to be too structured and have multiple points of entry? How can we get the tweens to embrace rigor when we have learned they disengage easily? While Something to Say was published in late 2013, it remains timely in a country where many urban youth of color do not feel safe. With the right approach, out-of-school-time arts programs can give those young people expressive and survival tools to develop their minds, their collaborative skills, and their self-awareness.